Kasa Gallery is hosting works by Assaf Gruber, Lia Lapithi and Devrim Kadirbeyoğlu between dates 20 May – 27 June. 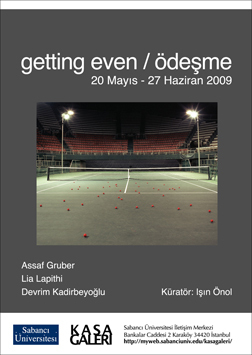 In the exhibition Getting Even, curated by Işın Önol, the artists who all come from geographies struggling unending political and social conflicts, although with different artistic attitudes, investigate the political conditions of their own localities by employing an ironic tension in their works. Once starting to exhibit abroad artists find themselves representing their country. From that moment on, they become the spokespersons of the political structure, official discourse, history and anything taking place in their country. This is a “responsibility” far beyond being sensible about the way things are. Whereas the artist, due to their social position, is the one who criticizes the dominant politics in their homeland first. Not represents but attacks; not only the state politics, but also all of the widely accepted systems. In this sense, as opposed to coming together in a nationality joke, an Israeli, a Turkish and a Cypriot artist do not bring together these three nationalities or the political positions of their individual states. The association here perhaps should be read as coming together of individual, local stories. Assaf Gruber (1980, Israel) Completed his masters degree in 2008 at Ecole Nationale Superieure des Beaux-arts, Paris. In 2009 he had solo shows in Gent, Belgium and Verona, Italy. Since 2005, he participated in group shows in many countries and in 2008 won the first prize in Les amis des beaux-arts de Paris.